I hope this newsletter finds you well. This week has been such a whirlwind of activity and meetings that I've not yet caught my breath. On Monday, our Board of Neighborhood Commissioners had their yearly retreat, and I'm looking forward to working with the enthusiastic Commissioners on a variety of policies in the upcoming year. Expect to see more on their discussion in the upcoming weeks once their retreat summary is completed. That evening, I followed North Valley Commissioner Lydia Grant to Granada Hills North Neighborhood Council to thank the outgoing board members for their work as the new board was affirmed by her. In the next few months, I'll be doing my best to get around to all of the Neighborhood Councils to express my appreciation in person for all the great work you do for your community. On Tuesday, I got a more detailed glimpse of Controller Ron Galperin's ControlPanelLA. I'm really very impressed with the fiscal information at our fingertips now not only for the City, but for Neighborhood Councils as well. Controller Galperin is taking his presentations on the road, and I highly encourage you to check it out. We'll let you know his schedule once it's set so you can see how the City spends your taxpayer dollars. Our partnership with LAPD and Valley Alliance of Neighborhood Councils for the first State of the Valley Public Safety Town Hall on Wednesday was a hit with over 250 people at Van Nuys City Hall. Councilmembers Martinez, Fuentes and Krekorian also stopped by to lend their support. We're now receiving requests to do others around the City and on a quarterly basis as well! A huge thanks to our wonderful outreach and elections staff, led by our fearless Director of Outreach and Communications (and Elections! ), Stephen Box, who worked with our Independent Election Administrators to make the event a success. This same crew, along with our great partners at the City Clerk, is also going all out on the elections. 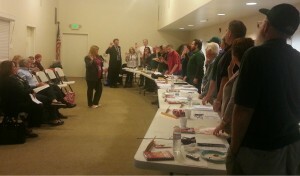 Congratulations to IEA Tony Wilkinson for closing Region 3 candidate filing strongly last night! I cannot emphasize what a massive job it is to make online candidate filing available for every region, verify the candidates and upload pictures and statements onto the website while also making changes for the new stakeholder definition. So please bear with us as we work out the kinks and make the necessary adjustments to hit our stride. I'm off to Region 4's Rally in the Valley tonight, but I hope to see you at the LANCC meeting tomorrow or at Mayor Garcetti's City Budget 101 in Porter Ranch on Monday night.